Notice the title of the book. Friendshape. 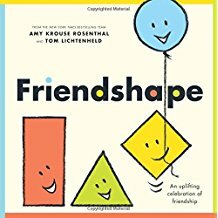 Not Friendship but Friendshape. Because friends shape who you are. The author, Amy Krouse Rosenthal, presents profound sentiments in the simplest language. Team that with Tom Litchenfeld's playful illustrations and you have yourself a winning picture book. "Friends make you feel happy." A happy face formed by the four friends—square, circle, triangle and rectangle. "Friends make you feel at home." The four shapes rearranged to form a home. Oh the sheer inventiveness of the illustrations. And the words. The friends as a teeter-totter with Triangle as the fulcrum, Rectangle the board and Square and Circle the riders. "You are going to be a wrecked angle," smiles Circle! Punny fun. No matter the color, shape or size, they are friends to the end!